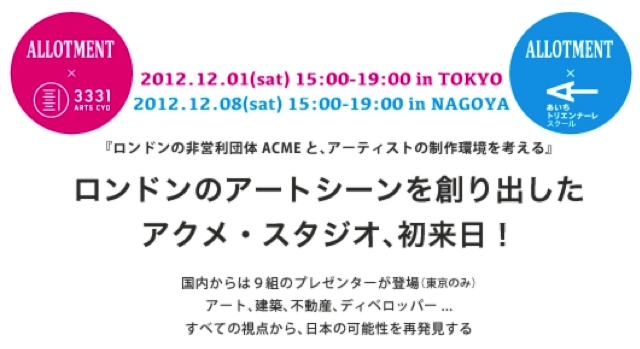 Allotment seminar at 3331 Arts Chiyoda in Tokyo on the 1st December 2012. Jonathan Harvey/ACME Studio CEO (London) will talks about his 40 years experience and knowledge of organizing ACME studios. Also the directors of 9 leading artist spaces in Japan will introduce their program. We will think about the work environment / studio for the artist. Artists need their studio to free themselves and create great work from the everyday practice. Launching the New Allotment website! Announcing the 2013 Travel Awards Winner!